Beta regression modeling with optional prior distributions for the coefficients, intercept, and auxiliary parameter phi (if applicable). Same as betareg, but we strongly advise against omitting the data argument. Unless data is specified (and is a data frame) many post-estimation functions (including update, loo, kfold) are not guaranteed to work properly. Same as betareg, but rarely specified. Character specification of the link function used in the model for mu (specified through x). Currently, "logit", "probit", "cloglog", "cauchit", "log", and "loglog" are supported. If applicable, character specification of the link function used in the model for phi (specified through z). Currently, "identity", "log" (default), and "sqrt" are supported. Since the "sqrt" link function is known to be unstable, it is advisable to specify a different link function (or to model phi as a scalar parameter instead of via a linear predictor by excluding z from the formula and excluding link.phi). In stan_betareg, logical scalars indicating whether to return the design matrix and response vector. In stan_betareg.fit, a design matrix and response vector. Further arguments passed to the function in the rstan package (sampling, vb, or optimizing), corresponding to the estimation method named by algorithm. For example, if algorithm is "sampling" it is possibly to specify iter, chains, cores, refresh, etc. See the priors help page for details on the families and how to specify the arguments for all of the functions in the table above. To omit a prior ---i.e., to use a flat (improper) uniform prior--- prior can be set to NULL, although this is rarely a good idea. Note: Unless QR=TRUE, if prior is from the Student t family or Laplace family, and if the autoscale argument to the function used to specify the prior (e.g. normal) is left at its default and recommended value of TRUE, then the default or user-specified prior scale(s) may be adjusted internally based on the scales of the predictors. See the priors help page and the Prior Distributions vignette for details on the rescaling and the prior_summary function for a summary of the priors used for a particular model. The prior distribution for the intercept. prior_intercept can be a call to normal, student_t or cauchy. See the priors help page for details on these functions. To omit a prior on the intercept ---i.e., to use a flat (improper) uniform prior--- prior_intercept can be set to NULL. Note: If using a dense representation of the design matrix ---i.e., if the sparse argument is left at its default value of FALSE--- then the prior distribution for the intercept is set so it applies to the value when all predictors are centered. If you prefer to specify a prior on the intercept without the predictors being auto-centered, then you have to omit the intercept from the formula and include a column of ones as a predictor, in which case some element of prior specifies the prior on it, rather than prior_intercept. Regardless of how prior_intercept is specified, the reported estimates of the intercept always correspond to a parameterization without centered predictors (i.e., same as in glm). Prior distribution for the coefficients in the model for phi (if applicable). Same options as for prior. Prior distribution for the intercept in the model for phi (if applicable). Same options as for prior_intercept. The prior distribution for phi if it is not modeled as a function of predictors. If z variables are specified then prior_phi is ignored and prior_intercept_z and prior_z are used to specify the priors on the intercept and coefficients in the model for phi. When applicable, prior_phi can be a call to exponential to use an exponential distribution, or one of normal, student_t or cauchy to use half-normal, half-t, or half-Cauchy prior. See priors for details on these functions. To omit a prior ---i.e., to use a flat (improper) uniform prior--- set prior_phi to NULL. A logical scalar (defaulting to FALSE) indicating whether to draw from the prior predictive distribution instead of conditioning on the outcome. 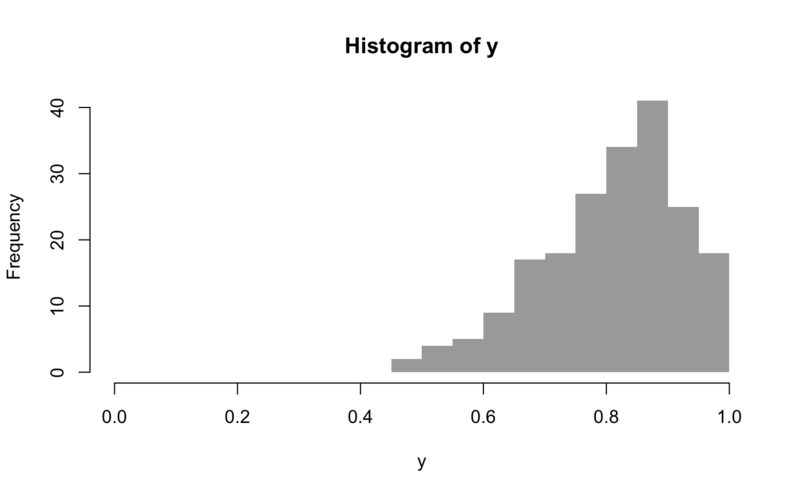 A string (possibly abbreviated) indicating the estimation approach to use. Can be "sampling" for MCMC (the default), "optimizing" for optimization, "meanfield" for variational inference with independent normal distributions, or "fullrank" for variational inference with a multivariate normal distribution. See rstanarm-package for more details on the estimation algorithms. NOTE: not all fitting functions support all four algorithms. Only relevant if algorithm="sampling". See the adapt_delta help page for details. A logical scalar defaulting to FALSE, but if TRUE applies a scaled qr decomposition to the design matrix. The transformation does not change the likelihood of the data but is recommended for computational reasons when there are multiple predictors. See the QR-argument documentation page for details on how rstanarm does the transformation and important information about how to interpret the prior distributions of the model parameters when using QR=TRUE. For stan_betareg.fit, a regressor matrix for phi. Defaults to an intercept only. A stanreg object is returned for stan_betareg. A stanfit object (or a slightly modified stanfit object) is returned if stan_betareg.fit is called directly. The stan_betareg function is similar in syntax to betareg but rather than performing maximum likelihood estimation, full Bayesian estimation is performed (if algorithm is "sampling") via MCMC. The Bayesian model adds priors (independent by default) on the coefficients of the beta regression model. The stan_betareg function calls the workhorse stan_betareg.fit function, but it is also possible to call the latter directly. Ferrari, SLP and Cribari-Neto, F (2004). Beta regression for modeling rates and proportions. Journal of Applied Statistics. 31(7), 799--815.